Supreme Court and Obamacare: What Donald Verrilli should have said to the court’s conservative justices. 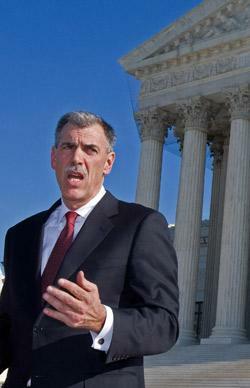 Solicitor General Donald Verrilli was grilled by the Supreme Court’s conservatives. Here is what he should have said. In the spirit of the season, please permit me to proceed in the same style of Socratic Dialogue powerfully on display in the oral argument itself. Q: What are the limits of congressional power? A: The limits are those found in the Constitution itself, of course—its text, its history, and its structure as glossed by subsequent practice and precedent. The Constitution expressly gives Congress the power to “Regulate commerce … among the several states.” Here, we have a genuine regulation—both the micro-mandate/penalty/tax and the larger regulatory regime of which it is an integral part. We have commerce under any reading of the word. Insurance is a purely commercial or economic question about who pays whom. And we have an underlying problem that is truly “among the several states.” The problem of health care creates spillover costs that cross state lines, problems that result in some states in effect imposing costs on other states or bearing costs that properly belong to other states. A: At any given instant, literally millions of Americans are out of state. Most of my students come from other states. I myself am out of state three days a week. If any of us falls sick while out of state, we can seek ER care in the host state. And unless we have insurance, we will be imposing costs on other states. Obamacare addresses this obvious interstate problem in a direct way. The two leading cases in which the court has recently invalidated congressional laws as going beyond the scope of the commerce clause—U.S. v. Lopez in 1995 and U.S. v. Morrison in 2000, involving guns in schools and violence against women—did not involve similar interstate spillovers. Those cases were thus rightly decided on commerce clause grounds, as I myself have argued. And these cases prove that limits do really exist. Q: Isn’t the obligation to offer ER care itself created by federal law? So isn’t your argument pure bootstrap—one intrusive federal law generating another? A: With due respect, no. The obligation to care for the urgently sick—including the strangers in our midst—is ultimately rooted in morality and centuries of tradition. Many ERs would and should pitch in even without a federal requirement, and the interstate problem is ultimately created by travel itself—travel that the interstate commerce clause in fact was designed to promote. Which leads me to a second and independent argument supporting Obamacare, namely . . .
Q: Before you get to that, wouldn’t your argument allow the feds to mandate burial insurance? Indigents sometimes die out of state, don’t they? A: Yes, but in what numbers, Your Honor? With due respect, it is easy to hypothesize from an armchair—but is there really, truly, an interstate problem of indigent interstate burials anywhere near the magnitude of the actual ER problem in America? States can individually handle burials, but any state that on its own tries to generously handle the health-care issue risks becoming a massive magnet for out-of-staters. Sick people can flock to states with generous medical benefits. And this really doesn’t happen with dying people leaving their home states just so that they can die on some other state’s nickel. Q: What about a federal mandate to buy broccoli? A: Thank you for that softball, Your Honor. There is no real, substantial, honest-to-goodness interstate spillover/externality problem with broccoli that I see at the moment. [Pause] Even if nothing I have said yet persuades Your Honors, my second commerce clause claim is that millions of Americans suffer from preexisting medical conditions. If they get a better job offer out of state, they should take it so that they can contribute more to their families and to the general economy. But they will not be able to do so if the out-of-state employer discriminates against preexisting conditions. This discrimination creates a huge lock-in of labor. It prohibits interstate mobility—the free interstate flow of services. The core purpose of the interstate commerce clause is to allow Congress to remove interstate barriers—legal, physical, economic—such as this. Q: That explains the ban on preexisting condition discrimination, but how does that explain the mandate? A: The two are of course intertwined, as Your Honors recognized on Day 3 of oral argument, regarding the law’s “severability.” The ban on discrimination will only work if almost all are obliged to insure before they become expensively sick. Q: But nothing you’ve said so far addresses the unprecedented issues raised by a federal mandate that a person buy a private product. A: Several answers, Your Honor. First, this law is hardly unprecedented. The Militia Act of 1792 had a similar mandate, obliging Founding-era Americans to privately procure muskets, ammo, pouches, and so on. George Washington signed onto that law. And no one at the time said that mandates such as this were somehow intrinsically improper regulatory tools. Q: Even if so, that law was passed under a different clause of the Constitution? A: It’s hard to see why that matters. If a mandate is a permissible regulation of a well-regulated militia, it is an equally permissible regulation of interstate commerce. In the most important case ever decided on the scope of congressional power, the iconic 1819 case of McCulloch v. Maryland, Chief Justice John Marshall said that because a corporation-creating law was a valid under one clause of the Constitution (the territories clause), a corporation-creating law should be equally valid under other clauses. What is true of corporation-creating laws is also true of mandate laws. Q: If 200 years ago, national security enabled government to mandate muskets, might national security today enable government to mandate vaccines? A: The next terrorist attack might very well be biological, Your Honor. And our best national defense is herd immunity, which does mean that we need a large percentage of Americans to have vaccines. They will be more likely to have such vaccines if they have insurance. And states cannot individually handle these issues well because viruses do not stop at state lines. They spill over. They create interstate externalities. McCulloch itself, I might add, was decided on national security grounds. In the wake of the war of 1812, Marshall explained how a national bank was useful in fighting wars and supporting armies. Q: You said that no one in 1792 thought mandates were somehow especially troubling. Why not? A: Because they understood simple logic—and we must do the same today. If government can tax me, and use the money to buy a musket/insurance policy with my name on it, and then give me the musket/insurance policy, then government can for the very same reason oblige me to procure the musket/insurance policy myself. I am being taxed/mandated by persons that I helped elect and that I can vote against. That is the main guarantee against abuse, as Chief Justice Marshall stressed in McCulloch and is obvious from the Constitution’s basic structure. And speaking of taxes, another easy way to handle this case is simply to uphold the mandate/penalty as a genuine revenue measure, enforced by the IRS and predicted by the Congressional Budget Office to improve the federal government’s fiscal situation by several billion—with a B—dollars a year. Q: But isn’t liberty especially at risk with these kinds of federal mandates? A: Respectfully, no. Not at all. I emphatically deny Your Honor’s key proposition. It flunks a logic test, and a history test, and a structure test, and—well, just about every other legal test I can think of. If government can take my money and pay it to Detroit, there is no liberty difference than if government tells me directly to buy from Detroit. And if one thinks that money is speech such that a compelled payment is a First Amendment problem, then the 1792 Act was unconstitutional; and all state mandates of health insurance (Romneycare) and automobile insurance are unconstitutional. And a vast range of other state and federal laws would also be unconstitutional. Nothing in the Constitution or history or structure—or precedents, for that matter—provides suitable support for the “mandates are different” intuition, which cannot survive analytic scrutiny. Such an opinion will not write—or if it does, it will not last. Q: Are there any middle positions that might generate a broader consensus on the Court? A: One possibility, perhaps, might build on various comments by Chief Justice Roberts and Justices Sotomayor, Kagan, Breyer, and others, at oral argument. The “mandate” should not be understood as free-floating requirement but simply as connected to the tax-penalty. In turn, the penalty can be upheld as a genuine revenue measure designed to bend down the cost curve. If the relevant statutory section needs in effect to be “reworded” to achieve this result, a judicial re-writing/re-reading of this section would be in keeping with various earlier cases, including the 2005 sentencing guidelines case of U.S. v. Booker and the 2009 Voting Rights Act case of NAMUNDO v. Holder. Both cases, in turn, can be seen as rooted in principles of judicial restraint and charitable interpretation famously put forth by Justice Brandeis in his concurrence in the 1936 Ashwander v. TVA opinion. With all due respect, several other possible approaches are also sketched out in an essay I wrote last summer for the Yale Law Journal online. And I’m sure that there are many other possible consensus positions that may emerge as Your Honors begin to deliberate among yourselves. Perhaps it would be too much to expect the kind of unanimity this court achieved in McCulloch, Marbury v. Madison, and Brown v. Board of Education—to name some of the most iconic cases. But an opinion that in some way genuinely crossed party lines would, with all due respect, be just what America now needs, and needs desperately, from the highest court in our land.